Temporary visitors are not allowed to engage in any paid activities. Short term studies at Japanese language schools are permitted. Travelers, who change airplanes or ships in Japan, may be eligible for a transit visa, which allows them to enter Japan for up to 15 days for sightseeing purposes, before proceeding to their final destination outside of Japan. All foreign tourists in Japan are required to carry their passports with them at all times. 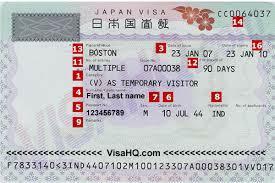 All other foreign student in Japan need a student visa in order to study in Japan. Visa applicants require an educational institution as their sponsor in order to obtain a student visa. Student visa holders are not allowed to engage in any paid activities, unless they get the permission of the school and the immigration office. Even then, students may work only a set maximum number of hours per week. Working on a tourist visa is prohibited.